Cooking and baking are rarely as difficult as we make them out to be and the foods of Australia and New Zealand are perfect examples of this. When you're looking for quick and delicious homemade foods, there are a few favorites that you should begin with. From breakfast and appetizers to main dishes and Aussie favorites, let's explore some of the best and easiest recipes these countries have to offer. You could begin your day with the Australian breakfast favorite known as a Fry-Up. It is similar to the bacon and eggs breakfasts enjoyed throughout the world, but the Aussie twist usually includes baked beans. 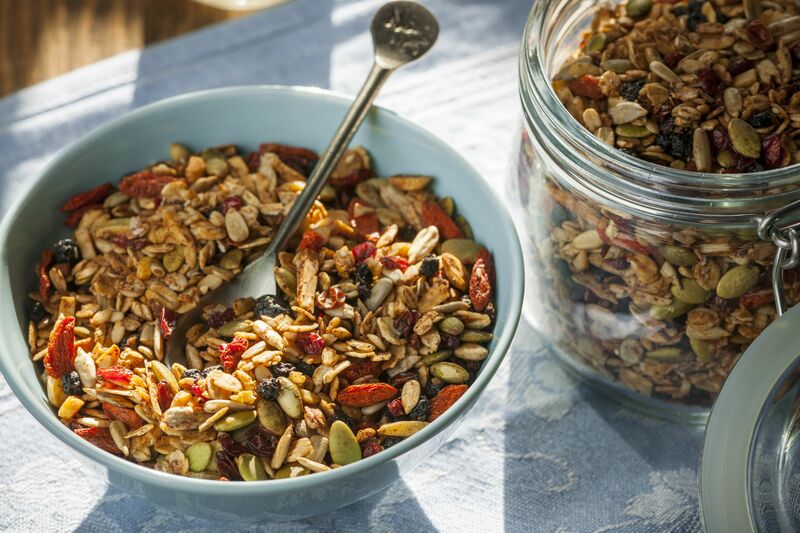 For a healthier option, consider making your own toasted muesli. It's a quick snack that's ideal for breakfast and a single batch can last your family for many days, even weeks. Better yet, form your muesli into bars for a quick, nutritious breakfast on the go. Australian cuisine is filled with fun appetizers like Beef Satay, which grills skewered steak covered in a coconut curry. Another fun and quick option is a plate of tuna and chickpea patties. These delightful little nibbles use chickpeas rather than potatoes and eggs to create a flavorful patty. The patties are filled with tuna, vegetables, cilantro, parsley, and a little chile pepper. They're fantastic when dipped into the homemade mint-yogurt sauce. Sweet potatoes are known as 'kumara' in Maori and they're a favorite vegetable in New Zealand. Yet, it may surprise you how well they work in a salad. This unique salad recipe places roasted kumara over a bed of romaine, then adds tomatoes, radishes, feta, and pine nuts. It's dressed with a simple combination of olive oil and balsamic vinegar and it all comes together in just a few minutes. As either an appetizer or main course, few soup recipes are as impressive as this Curried Carrot and Turnip Soup. You'll also be delighted to know that it's vegan, but don't worry, it's in no way boring. The soup is creamy because the vegetables are cooked, then pureed. It has an interesting layer of flavors thanks to spices like coriander, curry powder, ginger, and mustard. This is a soup that, while unique, is sure to please anyone at the dinner table. Australia and New Zealand are surrounded by oceans, so it's no wonder that fish makes a regular appearance in the foods. Fish Burgers served with tartar are a fun way to serve almost any dense fish you have and they grill up quickly. If you're looking for a freshwater fish recipe, this pan-fried trout with garlic and lemon is fantastic. It uses New Zealand's prized trout and cooks them up in a tasty dish, complete with grilled cherry tomatoes and buttery mashed potatoes. It's an entire meal! Among the best Aussie and Kiwi foods are two classics that are a staple in many households. You can, of course, whip up the Beer-Battered Fish and Chips and serve it alongside a Thai sweet chili sauce. Or, you can take the more portable route. What would Australia be without a classic meat pie? These are a favorite for sporting events and working lunches because they're so easy to transport. They're also filled with hearty goodness, including a tomato-based mix of lightly spiced ground beef. When it comes to Sunday dinner, many tables will feature lamb and the traditional lamb roast has long been a favorite. This recipe is a classic that lightly seasons the preferred cut of meat with rosemary and garlic. It is roasted on a bed of potatoes until it is mouth-wateringly delicious. Really, it's extremely simple to make, but you don't have to tell anyone that little secret. Everyone loves a little sweet treat every now and then and there are some tried and true favorites in Australia and New Zealand. Among the easiest are Jam Thumbprint Cookies, in which a dollop of your favorite jam (often strawberry) is placed in a well of dough. If you'd like to get a little fancier, there is the chocolate goodness of the Afghan Biscuit, a favorite in New Zealand. More elaborate still are the sought after meringues known as Pavlova. This is the recipe you need to pull out when the occasion calls for a truly impressive dessert. Plus, it's a lot of fun to make.